Directions: From Santa Barbara take US 101 west (north) approximately 20 miles to El Capitan State Beach entrance (Exit 117); 22.8 miles to Refugio State Beach entrance (Exit 120); 32 miles to Gaviota State Beach entrance. A day use fee is required, and camping is available by reservation only during peak seasons. Your camping or day use fee will allow entrance into all three locations. Directions: (Exit 120) From Santa Barbara take US 101 west (north) approximately 22.8 miles to Refugio State Beach entrance at Refugio Road. Exit the freeway here and drive north into Refugio Canyon. Birding can be done along this seven mile stretch of canyon road all the way to the summit of the Santa Ynez Mountains where the road turns to dirt and descends into the Santa Ynez Valley at Solvang (avoid during wet weather). See Interior - Mountains page at Refugio Road - Quiota Creek for a continuation of this route. Rewards: Spring and early summer birding along the riparian habitat in the lower portion of the canyon is excellent for flycatchers, warblers, vireos, kingbirds, swallows and orioles. Phainopepla might also be spotted. As the road winds upward you drive past grassy hills and enter chaparral habitat. As you reach the top the habitat is Coast Live Oak and Madrone. Directions: (Exit 108) From US 101 in Goleta take Storke Road-Glen Annie Road exit and drive south on Storke Road. At Whittier Drive turn west and drive a short distance to the location of the old parking lot on the left. You can park on Whittier Drive for access. Rewards: This former coastal golf course was purchased by the Trust for Public Land in 2013, and along with UCSB there are plans to restore the property into a functional and educational wetland. Once the restoration is finished, 57 acres of wetland will be created, including 24 acres of intermittently tidal estuarine wetlands and six acres of upland and transitional habitat, all linking to 650 acres of contiguous open spaces with trails, boardwalks, and interpretive facilities. Public access is now available although birders have been visiting this site for years since it has been a good coastal migrant trap. You can walk unhindered around the property exploring the trees planted along the fairways, and exploring the length of the creek from its upper end to the outfall at Devereux Slough. Many rarities have been found here over the years with fall and winter being the best seasons for birding. Directions: (Exit 108) From US 101 in Goleta take Storke Road-Glen Annie Road exit and drive south on Storke Road. Cross the Hollister Road intersection and continue south toward the coast. Where Storke Road veers to the left becoming El Colegio Road, keep right at the entrance road to UCSB West Campus and the slough. There are two pull-outs along the road from which you can look into the slough. If parking in the Cliff House lot at the end of the road (Coal Oil Point) a parking permit is required and must be obtained from Parking Services on the UCSB campus prior to visiting. You can park on side streets in Isla Vista on Camino Corto or Del Playa Drive off El Colegio and walk west to the point and slough. Look for UCSB Parking Services near the Main Campus (map >>). The Coal Oil Point Reserve website contains information about the Reserve including a map of the area with directions (link >>). Directions: From U.S. 101 in Goleta, exit Highway 217 (Ward Memorial Blvd. - UCSB exit) and drive south to the East Gate campus entrance kiosk. Ask for a campus map. 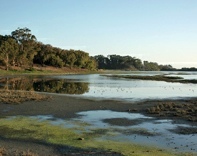 To reach the Goleta Slough Overlook, turn right on Mesa Road and continue west to Ocean Road. Look for metered parking spaces here and in regular C lot spaces in this same lot (16) or in lot 31, next to facilities management. To reach Goleta (Campus) Point, take Lagoon Road and go past the Marine Science Building. You can park in the metered spaces in the Marine Sciences lot if any are available, or you can go here in the evening or on a weekend and park in the regular spaces for a small fee. Head down to the beach and walk the trail up to the bluffs: (campus map >>) pdf . Rewards: Goleta Point is an excellent promontory for watching migrating seabirds in spring. Birders often make spring seabird migration counts from this spot. Hundreds of scoters, loons, shearwaters, jaegers, gulls and terns can be seen moving west offshore from March through May. Daily totals are impressive. A check of the rocks below will provide turnstones in fall and winter. In April of 2006 an American Oystercatcher was found here. 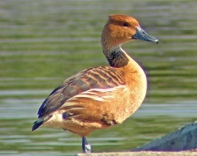 Birding at Campus Lagoon is good for waterfowl in winter where one can see American Wigeon, Ring-necked Duck, Redhead, Cinnamon and Blue-winged Teals (rare) in addition to several other expected species. When conditions are right, a variety of shorebirds will frequent the slough. A spotting scope is helpful at both locations. A look through the exotic plants around Manzanita Village near the lagoon can be good for land birds during migration periods and for winter vagrants. Directions: (Exit 107) From U.S. 101 in Goleta, exit at Los Carneros Road and drive north 0.4 miles to the park entrance on the right. A pathway encircles the lake. Directions: From U.S. 101 in Goleta exit Highway 217 (Ward Memorial Blvd. - UCSB exit) and drive south to Sandspit Road. Turn left (south) to Goleta Beach County Park entrance and drive to the end of the lot to see the estuary. Rewards: At the east end of the parking lot look for egrets, herons, gulls and terns where the channel empties into the ocean. More herons can be seen feeding in the upper portion of the channel where the entrance road crosses. An active heron rookery can be seen in the eucalyptus trees across from the parking lot where Great Blue Heron, Great Egret and Double-crested Cormorants regularly nest. Scoters and loons can be seen offshore from the beach and pier. Directions: (Exit 105) From U.S. 101 in Goleta, exit on Fairview Avenue and drive south, crossing the Hollister Avenue intersection, about 1.5 miles. Eventually the road makes a sharp turn to the right (west) becoming Fowler Road. Continue south past the Santa Barbara Municipal Airport terminal building and look for the sewage treatment plant entrance on the left at One William Moffett Place. The management is very accommodating to birders and the facility is open each weekday from about 8:30 to 5:00 (4:30 on Fridays). Visitors must sign-in at the office prior to birding. Park only in the lot near the office- do not park near the ponds. Birding is allowed around the parking area near the office and around the ponds. Trespassing is not allowed in sensitive habitat areas outside the plant and specific places within the facility so inquire where you can go. Directions: (Exit 103) Exit U.S. 101 in Goleta at Turnpike Road and drive south crossing the Hollister Avenue intersection to its dead-end. Walk the path to the creek. Atascadero Creek is also accessible from the 101 to South Patterson Road and driving south, turning right (west) on Hollister Ave. to Ward Drive on the left (south), and continuing to its end. Bird along the edge of the bike path running parallel to the creek in either direction. Rewards: Fall birding is best along this willow-riparian corridor. Migrant land birds regularly filter through this stretch of Atascadero Creek from August to November. Allen's Hummingbird is regular along the creek and in the yards adjacent to the path. Unusual migrants and rarities include Palm Warbler, Swamp Sparrow, Bobolink, Dusky-capped Flycatcher, and the only county record of Groove-billed Ani! This can be a great place for Blue Grosbeak and Indigo Bunting from August to October. It has been one of the best places in coastal California for Painted Bunting with a number of records. 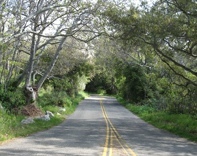 WINCHESTER CANYON is located at the western edge of Goleta off Cathedral Oaks Road. The small park at the entrance to the canyon has been a good spot for wintering rarities. The riparian habitat and wooded canyon along Winchester Canyon Road are worth birding for warblers and sapsuckers. Look through the riparian habitat and sycamore trees. Most unusual was a Red-headed Woodpecker in an orchard grove in winter of 1989. This park is just northeast of Lake Los Carneros off Cathedral Oaks Road. The dense redwood trees and live oaks in the park make this a pleasant spot to bird. 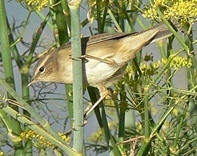 Migrant warblers and tanagers can be found here in spring. The famous Goleta area Zone-tailed Hawk used the park redwoods for a time as a consistent roost site with Turkey Vultures. This bird returned for 12 consecutive years to Goleta and was seen by scores of birders. The county-first Black Vulture also used the park as a roost site. This park is located off Cathedral Oaks Road west of Highway 154. 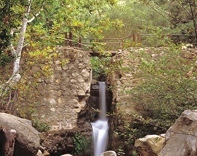 San Antonio Creek meanders through the park which is mainly oak woodland and sycamore trees. It is a good place to look for typical California woodland birds as you hike the long trail extending north into the foothill canyon. Woodpeckers, wrens, towhees, winter sparrows and Spotted Owl have been seen. ELING'S PARK is accessible off Las Positas Road on Jerry Harwin Parkway. Continue to the top of the hill to the parking area. Another access point is at the end of Calle Montilla. Unusual birds found here in fall of 2007 include Magnolia Warbler, Chestnut-collared Longspur, and incredibly, a third county record Dusky Warbler! Beach access at Arroyo Burro is at the end of Las Positas to Cliff Drive. You can reach the beach from the stairs at the end of the parking lot. 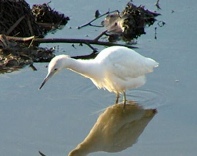 Birding along Arroyo Burro Creek can be rewarding in fall. The 70-acre Douglas Family Preserve (DFP) is accessed from the east at Borton Drive, Mesa School Lane, Medcliff Drive, and at the Oak Grove Trail at the intersection of Las Positas Road and the southern side of Cliff Drive. Directions: There are several wonderful parks worth exploring in the oak covered foothills of Santa Barbara. A few of these parks are accessible from the Mission Street exit off U.S. 101 (Exit 99). Drive north four blocks to State Street and turn left (west). Go two blocks and turn right (east) on Los Olivos heading past the Santa Barbara Mission. At the fork in the road, stay left to Mission Canyon Road. Enter from Mission Canyon Road a quarter mile past the mission on the right. Bird along Mission Creek the entire length of Rocky Nook Park for oak woodland birds and migrants. A Hepatic Tanager wintered at this location for 12 consecutive years! Birding through the museum grounds can be productive in spring and winter for a nice variety of woodland birds. The Natural History Museum is walking distance from Rocky Nook Park by crossing Mission Canyon Road, or drive one block north to Las Encinas Road on the left and follow the signs to the parking lot at the end of Puesta del Sol Rd. The exhibits in the museum are well worth the price of admission alone, including the Bird Diversity Hall with an amazing display of mounted specimens complete with California Condor, and a large collection of bird nests from the region. Continue north on Mission Canyon Road to its intersection at Foothill Road. Turn right (east) on Foothill for 2 blocks then left again to resume Mission Canyon Road heading north and bear right at the fork. Drive about 1 mile to the entrance at 1212 Mission Canyon Rd. Stroll through the grounds to see a vast garden of native plants, shrubs and trees, and follow the trail down to Mission Creek to explore shaded stream and canyon habitat. Birding here in spring, early summer and winter is best. Directions: Several parks within the City of Santa Barbara are worth exploring. Birders have visited these parks with some regularity and seasonal rarities have turned up. Parks with oak woodland, native botanical gardens, riparian habitat and coastal beach access include Bohnett Park, Skofield Park, Rattlesnake Canyon, Hidden Valley Park, Steven's Park, Shoreline Park, Alice Keck Memorial Gardens, Orpet Park, Parma Park and Oak Park. 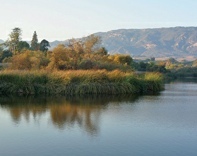 See the City of Santa Barbara Parks interactive map page (link >>) for details about each location. Rewards: The generally mild climate on the south coast in winter means Santa Barbara has a long list of over-wintering rarities. Tanagers, orioles, grosbeaks, hummingbirds, flycatchers, and warblers in particular, have been located in these city parks among the oaks, pines, blooming eucalyptus and riparian corridors. Adjacent neighborhoods with exotic plantings are also worth looking through. Directions: Exit U.S. 101 in Santa Barbara at Hot Springs Road. Cross under the freeway on Cabrillo Blvd. and immediately turn right (west) on Los Patos Way. The parking lot is to the left at the edge of the lake. Directions: To reach East Beach, Chase Palm Park and Stearns Wharf, Exit U.S. 101 in Santa Barbara at Hot Springs Road to East Cabrillo Blvd. and drive south and west along the beachfront about 3 miles to the intersection at Santa Barbara Street. Turn left (south) into the public parking lot. Rewards: Outfall channels from Garden Street create pools in the sand and are a common gathering spot for gulls and terns. The county's largest concentration of Black Skimmers are common at East Beach and are approachable for study or photography. At the Mission Creek and Garden Creek outfalls there have been as many as ten gull species in winter, including Thayer's Gull. Scan offshore for loons, grebes and scoters. Walk along the beach to check for gulls and wading birds in the wet sand. Snowy Plover is fairly common here. Across East Cabrillo from the beach is Chase Palm Park. This narrow park strip can be worth checking in fall. Bird the willows and weedy edges along Laguna Creek for migrants. This is where Lucy's Warblers have been consistently found in late summer and early fall. Directions: Continue west on East Cabrillo Blvd. to Santa Barbara Street about 1 mile to reach the harbor entrance on the left. The harbor can also be reached by exiting Highway 101 at Castillo Street. Park in the pay lots near the harbor marina. Rewards: Wintering loons, scoters and grebes are a common sight in the harbor. Red-throated, Common and Pacific loon can be seen here. In fall, winter and spring, walk the breakwater for rocky shorebirds. Look for turnstones, Surfbird and Wandering Tattler. Long-tailed Duck has been found here among the rocks, and Red-necked Grebes have been seen with Western and Clark's Grebes off the wharf. Directions: (Exit 86) To reach Carpinteria Creek- from U.S. 101at the city of Carpinteria, exit at Casitas Pass Road exit at Casitas Pass Road and drive one block south to Carpinteria Avenue. Turn right (west) on Carpinteria Ave. then make an immediate left on Palm Avenue. Follow Palm 2 blocks to 6th Street and turn left (east) into a parking lot at the end of the road. To visit the Carpinteria Salt Marsh Reserve, return to 6th Street and drive west to Linden Ave (Exit 86B). Turn left (south) on Linden and drive to the end of the street at Sandyland Rd. Linden Ave. is also an exit at Highway 101. Just drive to its end. Head west on Sandyland to Ash Ave. You can park along the length of Ash to access a couple of viewing points that overlook the canal at the east end of the marsh. Directions: (Exit 83) Rincon Creek marks the Santa Barbara and Ventura County line as the boundary line meanders with the creek all the way to the ocean. Birding the "left" side of the creek is considered Santa Barbara County, but it matters not because the habitat is great along both sides of the creek. To reach the Rincon Creek area exit Highway 101 south of Carpinteria at Bates Road and drive north about one-half mile to where Bates Road crosses the creek at a narrow stone bridge. This is a narrow road so park where safe to pull out. Return toward the 101 and cross under the freeway to reach the parking lot for coastal access at Rincon Beach Park. Rewards: Spring birding along Rincon Creek can be very rewarding for migrant land birds and nesting species. Birding from the bridge allows good views of the upper level tree tops where birds are often difficult to observe from below. 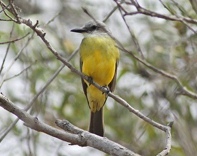 Pacific-slope Flycatcher, Western Wood-Pewee, Allen's Hummingbird, Wilson's Warbler, Swainson's Thrush, Yellow-breasted Chat, Black-headed Grosbeak and Bullock's Oriole are commonly seen. Olive-sided Flycatcher and Black-chinned Hummingbird also breed here. This riparian corridor is well known as a migrant trap in fall with the occasional rarity showing up. September and October are best. Birding at Rincon Beach Park is good for gulls, terns and offshore loons, grebes and scoters.